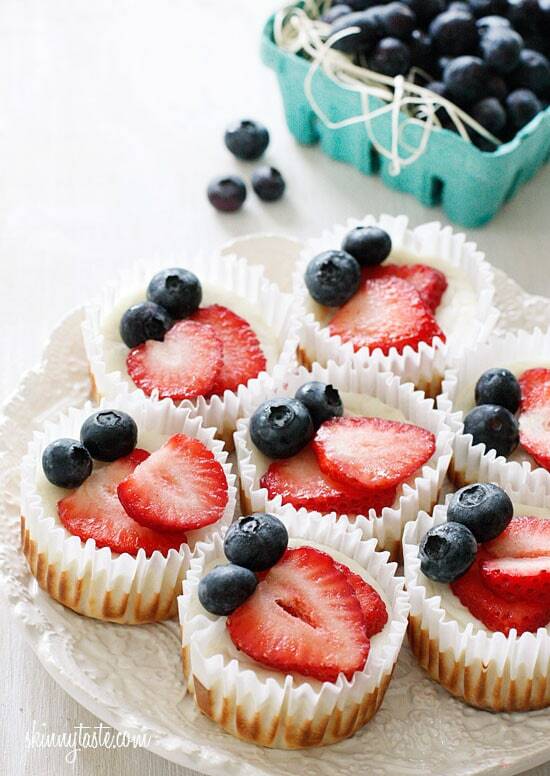 Mini cheesecake cupcakes made with Greek yogurt and cream cheese with a vanilla wafer crust topped with strawberries and blueberries to create a red, white and blue dessert using Mother Nature as my source for food coloring. 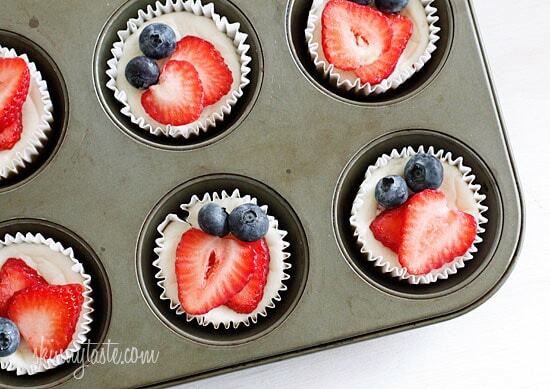 These are the perfect Memorial Day weekend treat, they taste too good to be under 100 calories! And if you prefer a lemon dessert, try these lemon cheesecake cupcakes instead. If you want them gluten free, leave out the vanilla wafer. Gradually beat in fat free yogurt, egg whites, and flour. Do not over beat. Bake 20-25 minutes or until center is almost set. Cool to room temperature then chill at least 1 hour in the refrigerator. Before serving, top with fresh strawberries and blueberries. Love this recipe!! I’ve been craving cheesecake and searching all over for one with less sugar but zero alternative sweeteners. I don’t know why I didn’t think of skinnytaste sooner! I made half of mine with the vanilla wafers and the other half without. I preferred the one without the cookie so I omitted it from my next batch (the lemon version). Also, no cookie means 2 cups for 4sp 🙂 can’t wait to taste the lemon ones! Excited to have these today at our 4th of July BBQ. Was hoping to make a few gluten free without the wafers but then realized they have flour in them. They’re not actually gluten free unless you use gluten free flour, correct? did you use wafers like the crispy layered ones or nilla wafers that are like cookies?? I used nilly wafers and it came out delicious! My family loves this recipe! Thanks Gina! Any suggestions on how to make the blueberries not roll off? I made these for the fourth and they were great! I plan to make them again next month with just blueberries for a baby shower but I need the blueberries to stick… Any low cal and not too sweet suggestions? Only thing I can think of is homemade cream cheese frosting and just using a tiny bit to make the blueberries stay. But I would love any other suggestions! These were great! Simple to make and delicious! I am allergic to eggs. Is there something I can substitute for them? I made these last night, and they turned out AWESOME! I deviated from the recipe, though, to try to make them even lighter. I crushed 2 full-size reduced fat graham cracker sheets and spread those equally between the 12 muffin cups instead of using the wafers (next time, I'll probably melt a tiny bit of light butter/margarine and mix that in to keep the crumbs from being so loose). I used an 8oz tub of fat free strawberry cream cheese instead of regular reduced fat & subbed Splenda for the sugar. Once they were cooled completely, I also spread about 1t of fat free cool whip onto each cheesecake before adding the berries. So delicious! Whole family enjoyed. Will for sure make these again. Can you make these without the cookie on the bottom… no cookie at all? You think they'd turn out ok? Has anyone tired that? Tasty and healthy recipe! These were a total hit on the 4th of July, thanks! Made these for the 4th of July, they were sooo pretty! smelled so good baking and they tasted great! Any GF sub for the flour in the mix if I used GF wafer? Amazing job Gina! These turned out so great and were a huge hit at my Memorial Day party yesterday!! I told my husband they were low fat and he then proceeded to give himself permission to eat 5 of them! I doubled the recipe with no issue, subbed Truvia for the sugar (made them only 2 points plus!) and put the muffin pan in a water bath to prevent cracking. So great! This is my new go to dessert recipe for parties. Thank you!! tastes good so that's all I care about! SO GOOD! My boyfriend loved them. I almost didn't tell them they were low cal! Thank you! These floored me and the family! They taste just like standard cheesecake and the presentation is so pretty. Everyone thought they took me forever to make! Amazing recipe!! Another YUMMO!! I made two batches of these for the Super Bowl, but I used Oikos greek strawberry yogurt and cafe latte instead and it was delicious! I used the liquid egg whites instead and it came out perfect. 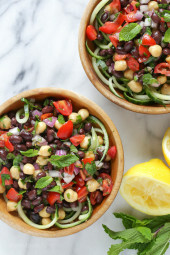 Thanks again for these great recipes for the waistline!!! OMG, these are so delicious! I made them last night and I'm planning the next batch today…because they are disappearing too fast. OK I am here to tell you these were amazing! I can't believe something so tasty can be so low in calories. I made it to test it before a dinner party coming up, and I will for sure be making these for my family! I really like that the servings size is only for 12 unlike regular cupcakes where you end up with a ridiculous amount you feel guilty for ending up eating all the leftovers like a cow. lol. This happened to me just last week. Also, this was a great way to bond with my son who is almost 5. He helped me so much with them! He put the cupcake liners in, placed the cookies, helped mix (after I mixed), and when they were cool he added the strawberries and blueberries ! This was my first time using your site and I plan on using this site for EVERY meal. Can Cream Cheese spread be substituted for block cream cheese? My batter came out lumpy from the oven. Did I do something wrong? I smoothed the top of the batter before I put them in the oven to bake. They are cooling now, hopefully the lumpiness will not take away from the taste! Mine have been in the oven for 5 minutes and I just realised I forgot to put the flour in the recipe – is this a big problem? Actually I just tried one after being cooled in the fridge and they taste lovely so I guess its ok without flour! These were good however I think they would have been better with strawberry greek yogurt. I'm not a huge fan of vanilla greek yogurt and to me, that was the predominant flavor. Overall, a good treat! 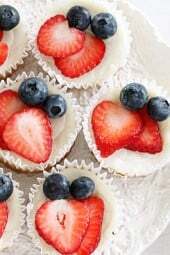 Made these for 4th of July yesterday (along with the Honey Lemon Bars) and they got RAVE reviews from everyone!! And they were all shocked that they were a Skinnytaste recipe! 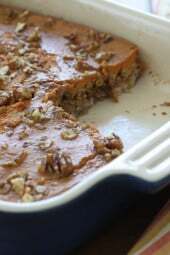 Super yummy- a definate keeper recipe!! I made these for the fourth yesterday and they were AWESOME! Thanks so much! hey there! I love your blog & I cant believe I seen it in Fitness! well, I can believe it because you have really great recipes but I put a link on my blog to this recipe and the ginger carrot dressing one if you wanna check it out, I just wanted to give you a heads up and say thank you for sharing! I made your garlic shrimp pasta with the 1/2 & 1/2 , white wine, & tomatoes and it was the best thing I have ever made. It seriously tasted like something from a restaurant. They're cooling in the fridge right now … Sooo close to being ready to be DEVOURED! I gave my dad a taste of the batter and he couldn't believe they were only 100 cal/cupcake! It's just as rich and creamy as regular cheesecake, minus the guilt! I made these for a 4th of July picnic that we are having today. They are in the oven as I type. I cannot wait to serve the little creations to my family. I am sure from all of the comments they are delish! The only suggestion that I have is that if there is anyway that you can go back up into you recipe and edit it stating the recipe uses standard size muffin/cupcake pans. The picture makes it look like they are the small mini muffins. I almost used the mini ones, but when i saw the amount of batter, I realized that was a lot for 12 mini cakes. After reading the comments, I saw your post that it was NOT the mini pans. Just a suggestion! Thanks for the recipe! Gonna make these tomorrow for the 4th! I can't wait to try these. Thank you for sharing the recipe. i dont have an electric mixer. can i mix by hand or do i need the mixer? These are SOO good. Instead of vanilla chobani I used strawberry and it was so delicious. Also since they came out a pretty pink color I put only blueberries on top and then put a little whipped cream on top of that. And I didn't use the wafers on the bottom, but you don't even need it so why waste the extra calories! Just made these so yummy! Yet another great recipe. These are awesome!! So delicious and filling. Just enough to satisfy my sweet tooth. And less than 100 calories! Thank you, Thank you, Thank you!! For this recipe I took them to a family cook out and everyone loved them and wanted the recipe. They are great and easy to make. I made these for my weight watcher group today and everyone loved them…all the recipes on this site look so amazing – thanks!! I made these too satisfy my sweet tooth. Amazing and easy to make and my kids love them. Thanks Gina for sharing your receipes with us to this date we have not missed eating a piece of fruit or having our veggies. We plan all our meals from your website. I didn't realize they were regular size. I made them in mini cupcake pans and they turned out great. They are really cute! Will they keep well if I make them the night before? So far I'm leaning towards mexican vanilla extract. I run a website that shows people how to make vanilla extract. 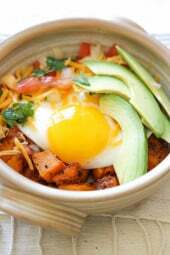 I'm always looking for recipes to showcase the different flavors (Mexican, Tahitian, Indian,…). This is definitely on my list. I made this last night and served them tonight for dessert. I had left over graham crackers from your strawberry swirl cheesecake, so I made that crust on the bottom instead of the vanilla wafer. Yummy!!! yay!! it was a success! I only did 1 thing different!! I crushed the 12 cookies and used 20 pumps of butter spray and mixed in some cinnamon and put 1/2 tbs of this mixture at the bottom of each of the cups instead of the whole cookie…..It was a success! Hubby loves them! Could I make these a day or two before? I used cranberry-fig Greek yogurt and they turned out delicious! Made these last night, SOOOO yummy!!! Thank you Gina for another "to die for" recipe! Made these this weekend – turned out great. The only change I made was to substitute Splenda for the sugar. Made these tonight three different ways. Sprinkled mini chocolate chips on some. Dolloped a little of my blueberry jam on the tops of some and swirled into the batter then did the same with some of my strawberry balsamic jam. Came out great! These are delicious! My 10 year old made these by herself with plain Greek yogurt and they were still SO yummy! (I do not like vanilla wafers so we used ginger snaps and they were very good!) We topped them with strawberries, blueberries and blackberries. We did not adjust the sugar or the vanilla for the plain yogurt and they were still perfect! Thank you! I just discovered your site, and I made these for a work potluck today. They are super tasty and easy! I am planning on making them again for a bridal shower on Saturday. I'm very excited to try many other things! So, this is the first time I've commented (I usually stalk this website quietly from afar) but, I wanted to tell you how INCREDIBLE these are. I used blackberries instead of blueberries, but other than that, followed your instructions completely. Ahhh-MAAZZEE-innnggg. You are a genius. Seriously. So many of your recipes have become staples in our house (heellooo cilantro lime shrimp)! Thank you for creating so many wonderful things! Loved these! made them this weekend for a party and bought more cream cheese to make another batch for my husband and I!! Definitely trying this for camping fourth of July! Could the blueberries be cooked inside the batter? They won't look as cute as the do on top, but I have some picky eaters who only like "cooked" blueberries! Made these for Memorial Day and everyone loved them. Didn't change a thing except to add some little flag picks from the dollar section of Target. So cute! These mini cheesecakes were wonderful. I'm new to Weight Watchers and a friend at work provided me the link to your site. I tried three of your recipes this weekend: these cheesecakes, the bangin' shrimp and edamame fried rice. All were absolutely fabulous! Thanks so much for coming up with all of these. I made these for a Memorial Day weekend BBQ and they were a huge hit! Everyone was passing up the dirt cake for the cheesecake cupcakes! Thanks for sharing this great recipe and all your others, as well! This looks awesome, as usual! I made these today and it was delicious! My teen girls that are always turning up their noses at weight watchers was very happy. How festive for memorial day! I have so many strawberries and blueberries to use up right now too, thanks for the recipe! Under 100 calories for cheesecake!?! I'll take two please! definitely just pinned this recipe, it looks so amazing! I made them this morning for a memorial day party this afternoon- Even though i only have 11 to bring to the party now b/c i had to taste test…they are awesome and so easy! Made this Yesterday! Awesome Hit! Used graham crackers at bottom instead of vanilla wafer. Problem is they are almost gone. So light and delicious. Love your recipes! So pretty! I'm usually not a cupcake fan but with fruit on top these appeal to me. Great for red, white and blue holidays! Can you replace the flour with cornstarch? These are so cute! I love that you used Greek Yogurt! Yum! Great recipe! My recipe is just about the same as yours. 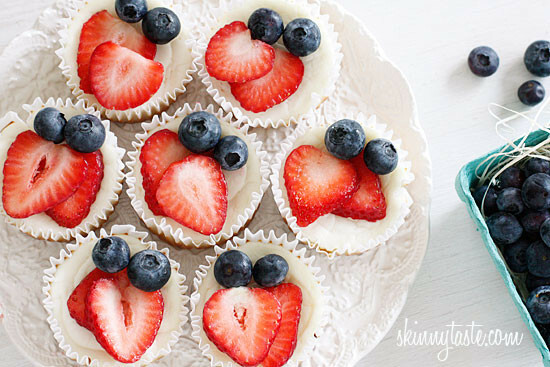 You can't go wrong with mini cheesecake cupcakes! Have a wonderful Memorial Day Weekend! Sure, you might need to slightly adjust the sugar, I would taste it. I find the nilla wafers get soggy at the bottom when I've made your other cheesecake cups. Do you or could you make an option with a skinny graham wafer crust? When I made them I had the same issue. Not sure what to do about it. They are supposed to get soft, they melt in your mouth that way. You could try fat free graham crackers, throw them into the processor to make crumbs and add just a tiny bit of a low cal butter substitute, pack into each cupcake liner, then bake it for a few mins til' they're set then follow the rest of the recipe. Hope that helps. I have another mini cheesecake recipe where I do that, however it's not low cal, but I'm sure you could make this work for little or no difference. 🙂 I think I'll try the wafers thing, I would think them getting soft might be yummy too. You could put the vanilla wafers on a cookie sheet and bake them more before you put them in the bottom of the liner. This would be the same idea with baking a graham cracker crust! These look amazing! Printing recipe and ready to try this weekend!! Thanks!! Are these mini cupcake liners? Looks like, just checking. Can't wait to make these this weekend! No, you should use a regular size muffin tin and liners for this recipe, not mini. Thank you for asking this. I used mini…sigh. However, because the wafers were to big for the mini cupcake liners/pans, I pulsed the cookies and put 1/4 tsp in the bottom of each paper then filled the mini cups. It worked out pretty well. I am not sure if it cuts the points since its half the size, I put these in a pan and made an american flag for the 4th of July. I love your recipes! Thank you. How long did you cook them? I love your cheesecake cups! I've tried your pumpkin ones and they were great. I'm sure these will be as well! What a perfect dessert for Memorial Day! Looks and sounds GREAT! Perfect summer treat. i was just wondering what can I use if I don't find VANILLA Greek yogurt? I've added vanilla extract and some sugar to plain yogurt as a substitute (which is what I usually do, to be honest, b/c I use less sugar than the vanilla greek yogurt has). Can you make a recipe using a sugar substitute like truvia? Would I use the same amounts if just swapping the sugar for truvia? Anytime I use Truvia, I look at the amount chart on their website, I think 1/4 cup sugar is equal to 8 packets of Truvia. After that just taste test as you go, since it's being baked you'll want it to taste a little too sweet since the sweetness bakes off a bit. Truvia is so bad for you, you should try using palm sugar. These are so beautiful! I love the combination of yogurt and cream cheese. Can't wait to try them! These look great as usually! Prefect for weekend BBQ! Those look so good!! Thinking of making them for my last day of class on Thursday!